Ok, you are at home ready to take a nice hot bath – your kids are away at their grandparents, and your partner is out with his friends.. and you are looking forward to a relaxing day. No plans for anything special for dinner. Perhaps left overs, a good salad, but whatever you have, its only for you so no need to please anyone but you. Then suddenly you hear – HI MOM. The kids decided to come home, then HI Hon, the significant other is there. OR friends, in-laws, etc.. drop in unannounced. Its 4:30pm and you have not planned on dinner, but they soo expect dinner. So what do you do. Relax. You are well prepared for this type of situation as long as you have pasta and canned tomatoes, a little cream (milk) and your favorite oil based dressing.. dinner is 30 minutes away. This happened to me this week. I was expecting my son to be at his grandparents for the week.. I thought I would have 4 days to myself. One day into it, boom – there is my son at my front door. I did not go shopping, so I had to make due. He loves vodka sauce. I thought I had a jar of it in the house and said I would make it.. But alas, I did not, we used it the last time I was strapped.. So, what is one to do? Improvise. 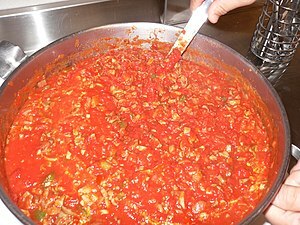 Below is a quick sauce I made (2o minutes), that tasted close to vodka sauce, but no vodka. Even if you have never had it before, it is a good sauce. 1/4 cup heavy cream (or milk, or sour cream, cream cheese (whatever you have on hand, etc…) You can omit if you don’t have it, its still a good quick sauce without the cream. In a separate sauce pan (or saute pan the wider the pan the faster it cooks as more ingredients are in contact with the heat), add the oil or butter to the pan over med-high heat. then add the onions and garlic (if using). When the onions start to become translucent, add your favorite Italian salad dressing of choice, the oregano and the bouillon of choice. Break up the bouillon. Stir and continue to stir about 1 – 2 minutes until simmering.. Reduce heat if necessary. Add in the canned tomatoes, and water ( it is best to use the water to rinse the cans to get all the tomato goodness and add that to the sauce ), add the pepper (if using – can even use red pepper flakes if you want a little spice), and wine (if using). Let simmer about 1o – 15 minutes. During this time check on the pasta. Drain the pasta if done prior to the sauce being done. Use a little of the sauce to stir with the pasta to keep it from sticking or use a drizzle of olive oil. Continue to stir the sauce to prevent from sticking. After about 10 – 15 minutes, remove from heat, add in the cream and cheese (if using). Whisk until incorporated. Taste and adjust seasoning if needed (pepper, cream, etc.. reminder – Cream will help dilute saltiness). Serve. Some like their pasta tossed in the sauce before serving, others like the sauce on top. It is all how you like it. sautéed/blanched Spinach, broccoli, carrots, combo, etc.. This will make a great delicious fast dinner on the surprise or even just for a week night dinner when most of us have limited time. Enjoy and good luck with the continued surprise attacks. I am putting together another post that will also suit this category. Posted by culinaryease on December 30, 2010 in Cooking for two or less, General Cooking, Recipes, Vegan/Vegetarian and tagged Pasta, quick dinner, quick sauce, Tomato sauce.